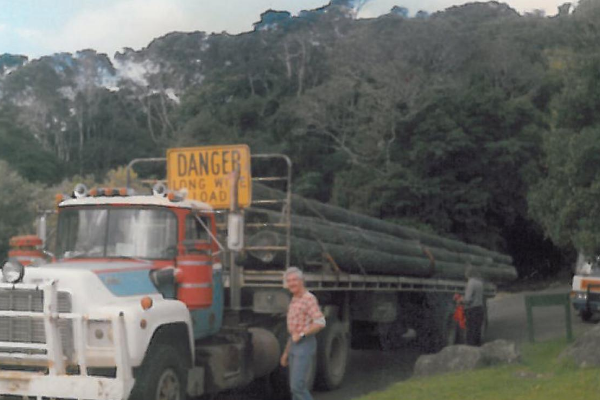 Just like the legendary Tarzan with a love of botany and climbing trees, one visionary man had a dream some three decades ago to immerse himself high amongst the rainforest canopy of Lamington National Park. 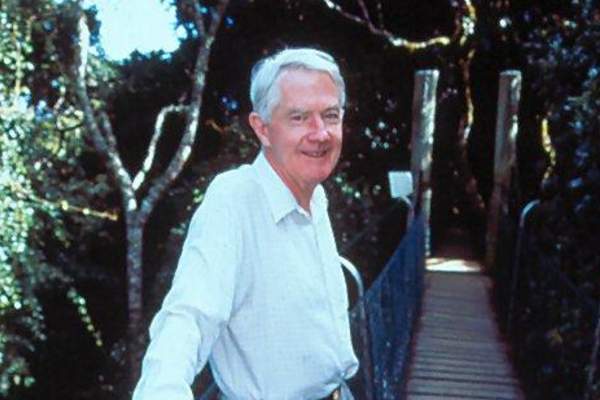 Peter O’Reilly (now aged 84), or Big Pete O’Reilly, as he is referred to by his friends and family was the driving force behind construction of the world’s first Tree Top Walk. Bringing a single man’s vision to the forefront of Australian Geographic Magazine (2014) as one of Australia’s very best Tree Top Walks (and not too mention a world’s first)! Sharing the 30-year construction milestone (in 2017) alongside the popular Dirty Dancing production featuring Patrick Swayze and Jennifer Grey, the O’Reilly’s Rainforest Retreat Tree Top Walk invites guests 15-metres above the forest floor – where the trees are drenched in sunlight, flowers and fruit – attracting many local birds and insects. The concept for the construction is recounted in Peter’s autobiography, The Spirit of O’Reilly’s: The World At Our Feet (2008) and was derived in 1982 one starry evening while camping by the nearby Glow Worm grotto with his daughter Woo. 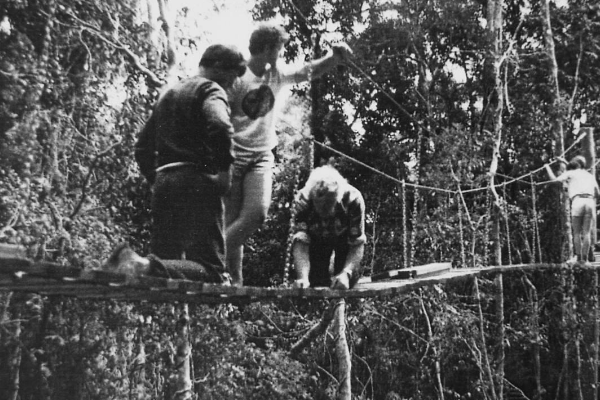 After initial installation of a smaller prototype-style bridge near the Wishing Tree Track, a much grander suspended walk was later designed by with the help of local engineer, Peter Main, and supported by the Green Mountains National Historic Association of which Peter was an honorary member. A striking Mararie fig tree spotted with blooming ferns and orchids was hand selected as the focal point for the walkway and was initially surrounded by three suspension bridges. However, due to huge public and media interest an additional six bridges were soon installed to create a one-way circuit, avoiding traffic congestion and allowing a more user friendly experience for guests. The 180-metre long and 15-metre high environmentally friendly structure boasts native support timbers (not steel or foreign materials). 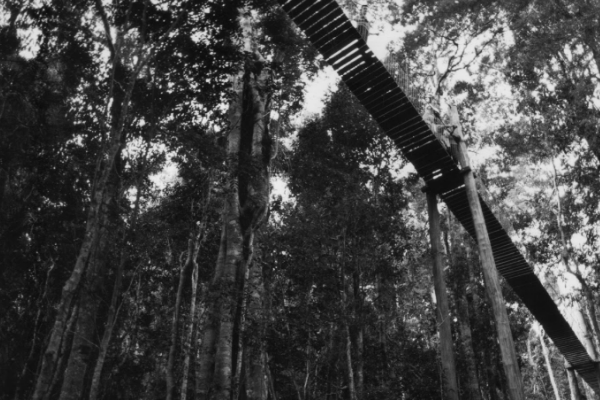 It was tirelessly crafted on steep terrain with every supporting pole, cable, turnbuckle, rope and timber board installed with passion and a desire to share the rainforest with others. Offering guests a different perspective, two observatory platforms were installed on the trunk of the fig tree an additional 15-metres high and accessed via a sturdy ladder surrounded by a wire cage for safety. The epic views over the rainforest a well worth the climb! The completed walkway was launched by Peter himself in the pouring rain of late 1987 and has been shared with hundreds of thousands of people from various cultures and nationalities, and managed via a donation box at the conclusion of the track to assist with ongoing maintenance.